On a hilltop behind campus stands the Geissberger Observatory. Though the outside might not seem imposing, what lies within is impressive—as is the project Assistant Professor of Physics & Astronomy Brian Hill and his students have taken on with the MIT–led NASA mission, Transiting Exoplanet Survey Satellite (TESS). This last summer, Hill worked with engineering major Ariana Hofelmann to make improvements to the observatory. After successfully completing their planned improvements, they applied to the TESS Follow-up Observing Program (TFOP). TESS aims to discover thousands of exoplanets—which are planets orbiting stars outside our solar system. Hill and Hofelmann were accepted into the TFOP subgroup, which consists of a large network of observers that will help confirm or invalidate candidates identified by TESS. “We are incredibly fortunate that the TESS collaboration has created a path for observatories like ours to do ground-based follow-up on the new exoplanets it is finding,” said Hill. After TESS identifies a candidate, the TFOP network of observatories and researchers examines it to confirm or invalidate whether a star has an exoplanet eclipsing it. Here at SMC, to tune up for this work, a 115mm Stellarvue on a Losmandy GM8 mount was used to take images of eclipsing binary stars. These are easier targets than exoplanets, and the work could proceed in parallel with the upgrades to the 16” Schmidt-Cassegrain telescope in the dome. Once the improvements were complete, the team switched to using the 16” telescope to detect previously known exoplanets. On the basis of the quality of the exoplanet transit data and the associated analyses, the Saint Mary’s team applied to a TFOP subgroup and got news of acceptance at the beginning of August. “The ball is back in our court to prove that we can use the early access to the satellite data to usefully contribute to TFOP Sub Group 1,” Hill added. 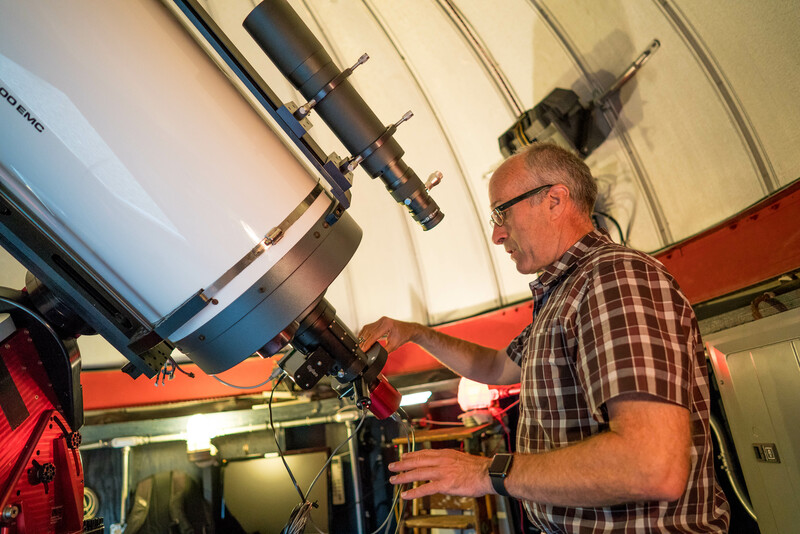 The Saint Mary's College Geissberger Observatory is the vision of the late Professor Ronald P. Olowin and was created with a generous gift from the Geissberger family in memory of Norma Geissberger. Completed in 2004, the observatory stands 277 meters above sea level and allows students to conduct advanced scientific research. For more information on the TESS Follow-Up Observation Program, visit https://tess.mit.edu/followup.